One GREENIES Hip + Joint Dental Treat is all it takes for clean teeth, fresh breath and a happy dog. 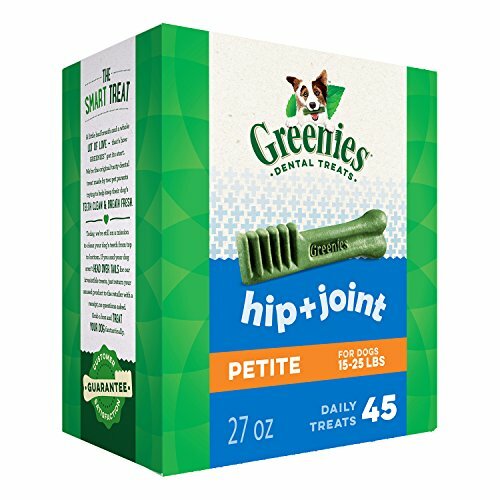 Specially prepared with natural sources of glucosamine and chondroitin to help promote healthy joints, these GREENIES Treats for Dogs feature a delightfully chewy texture that fights plaque and tartar. Irresistibly tasty and incredibly powerful, GREENIES Hip and Joint Treats for Dogs are recommended by veterinarians for at-home oral care. Best of all, these natural dog treats are made with highly soluble ingredients that are safe and easy to digest. Give your dog the mouth-wowing treat that helps promote their overall health with GREENIES Dog Treats. If you have any questions about this product by Greenies, contact us by completing and submitting the form below. If you are looking for a specif part number, please include it with your message.